The Giant Sojourn 1 is a trekking shoe, suitable for touring, commuting, light-duty singletrack, and recreational road riding. They are compatible with Shimano SPD pedals and others that use the two-bolt cleat mounting system. 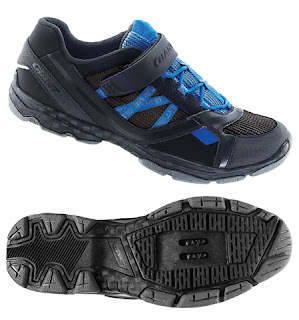 Features include the Force Drive Nylon midsole and rubber outsole with TourGrip™ Tread, 2X Stable Upper with multilayered air mesh, removable Velcro straps on top of the laces with a lace pocket for safety, and ErgoComfort footbed with TransTexturaPlus anti-odor Tech. $100.00 per pair. 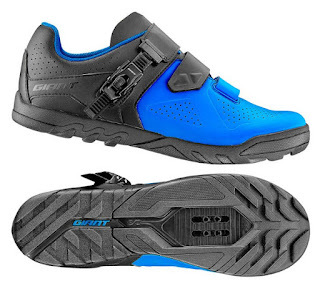 The Giant Line MES is an aggressive off-road cycling shoe featuring a full-coverage rubber tread for stability and traction, wider range fore and aft cleat position adjustment, seamless hydrophobic material upper to provide protection and ventilation, QuickFit upper buckle and two hook-and-loop straps for on-the-fly adjustments, and ExoBeam molded nylon midsole plate providing pedaling stiffness with the flexibility you need for better stability and traction on rough terrain. $140.00 per pair. For women who like to rip, the Liv Cycling Fera shoes feature the ForceDrive Nylon midsole and rubber outsole, SPD clipless-compatible with the TrackBone™ Tread, enhanced stretch resistance synthetic leather upper, three large Velcro straps, and ErgoComfort footbed with TransTexturaPlus anti-odor Tech. $100.00 per pair. 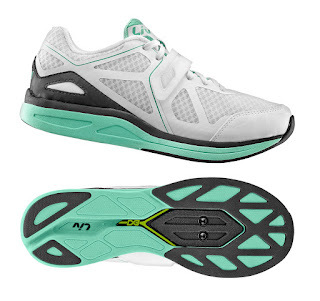 The Motion Efficency System (MES) of the Liv Cycling Avida fitness shoes combines a stiff and highly efficient pedaling platform with just enough torsional flex to allow for natural foot, ankle and knee movements during the pedal stroke . The ExoWrap hugs the foot to create a customized, secure fit. 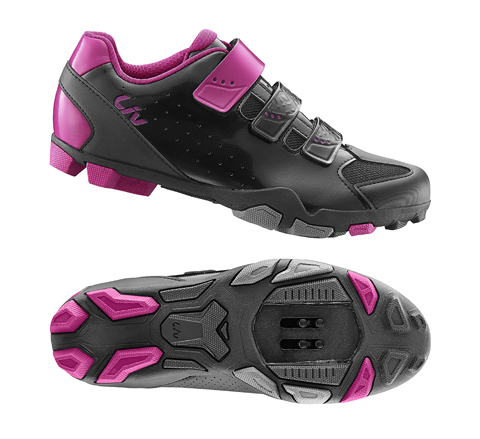 Removable cover for the window of the cleat makes the shoe compatible with flat pedals or 2-bolt cleats. $110.00 per pair.